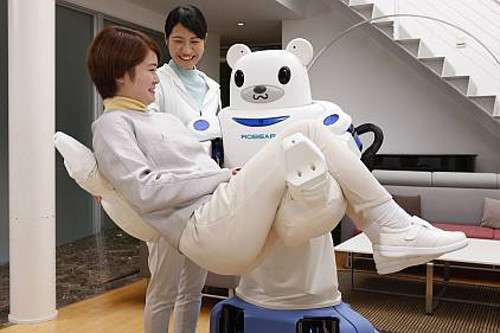 Scientists from RIKEN and Sumitomo Riko Company Limited have developed a new experimental nursing care robot, ROBEAR, which is capable of performing tasks such as lifting a patient from a bed into a wheelchair or providing assistance to a patient who is able to stand up but requires help to do so. 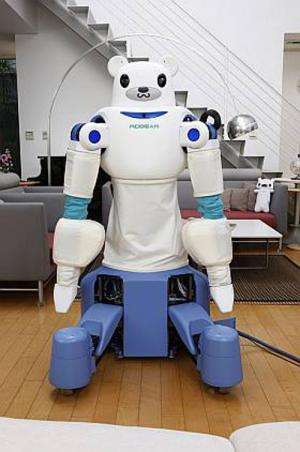 ROBEAR will provide impetus for research on the creation of robots that can supplement Japan's need for new approaches to care-giving. The new robot developed by the RIKEN-SRK Collaboration Center for Human-Interactive Robot Research in Nagoya is a successor to RIBA, which was announced in 2009, and RIBA-II, which was developed in 2011. The new ROBEAR robot is lighter than its predecessors, weighing just 140 kilograms compared to RIBA-II's 230 kilograms, and it incorporates a number of features that enable it to exert force in a gentle way.